1. Baker, B. S., Smith, D. A., and Gatti, M. (1982) Region specific effects on chromosome integrity of mutations at essential loci in Drosophila melanogaster. Proc. Natl. Acad. Sci. USA 79, 1205-1209. 2. Gatti, M. and Baker, B. S. (1989) Genes controlling essential cell-cycle functions in Drosophila melanogaster. Genes Dev. 3, 438-453. 3. Bonaccorsi, S. and Lohe, A. (1991) Fine mapping of satellite DNA sequences along the Y chromosome of Drosophila melanogaster. relationships between satellite sequences and fertility factors. Genetics 129, 177-189. 4. Lohe, A. R., Hilliker, A. J., and Roberts, P. A. (1993) Mapping simple repeated DNA sequences in heterochromatin of Drosophila melanogaster. Genetics 134, 1149-1174. 5. Csink, A. and Henikoff, S. (1996) Genetic modification of heterochromatic association and nuclear organization in Drosophila. Nature 381, 529-531. 6. Savoian, M. S. and Rieder, C. L. (2002) Mitosis in primary cultures of Drosophila melanogaster. J. Cell Sci. 115, 3061-3072. 7. Ceron, J., Gonzalez, C., and Tejedor, F. J. (2001) Patterns of cell division and expression of asymmetric cell fate determinants in postembryonic neuroblast lineages of Drosophila. Dev. Biol. 230, 125-138. 8. 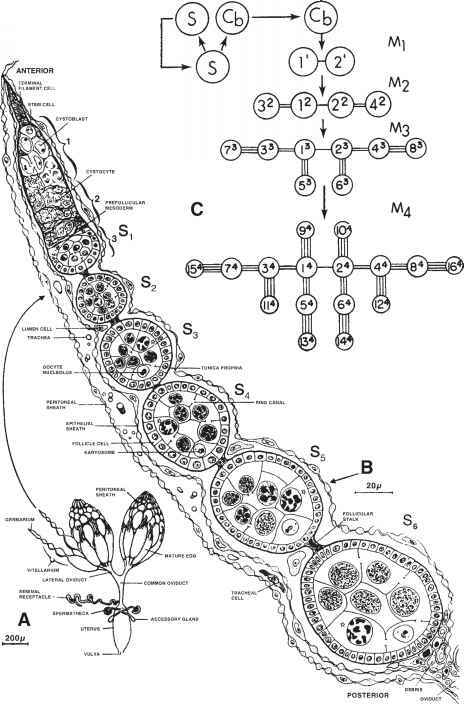 Truman, J. W. (1990) Metamorphosis of the central nervous system of Drosophila. J. Neurobiol. 21, 1072-1084. 9. Truman, J. W. and Bate, M. (1988) Spatial and temporal patterns of neurogenesis in the central nervous system of Drosophila melanogaster. Dev. Biol. 125, 145-157. 10. Ito, K., Urban, J., and Technau, G. M. (1995) Distribution, classification, and development of Drosophila glial cells in the late embryonic and early larval ventral nerve cord. Roux's Archiv Dev. Biol. 204, 284-307. 11. Datta, S. (1995) Control of proliferation activation in quiescent neuroblasts of the Drosophila central nervous system. Development 121, 1173-1182. 12. Audibert, A., Debec, A., and Simonelig, M. (1996) Detection of mitotic spindles in third-instar imaginal discs of Drosophila melanogaster. Trends Genet. 12, 452-453. 13. Schilstra, M. J., Bayley, P. M., and Martin, S. R. (1992) The effect of solution composition on microtubule dynamic instability. Biochem. J. 277, 839-847. 14. Basu, J., Bousbaa, H., Logarihino, E., et al. (1999) Mutations in the essential spindle checkpoint gene bub1 cause chromosome missegregation and fail to block apoptosis in Drosophila. J. Cell Biol. 146, 13-28. 15. Donaldson, M. M., Tavares, A. A. M., Ohkura, H., Deak, P., and Glover, D. M. (2001) Metaphase arrest with centromere separation in polo mutants of Drosophila. J. Cell Biol. 153, 663-675. 16. Scaerou, F., Starr, D. A., Piano, F., Papoulas, O., Karess, R. E., and Goldberg, M. L. (2001) The ZW10 and Rough Deal checkpoint proteins function together in a large, evolutionarily conserved complex targeted to the kinetochore. J. Cell Sci. 114, 3103-3114. 17. Williams, B. C. and Goldberg, M. L. (1994) Determinants of Drosophila zw10 protein localization and function. J. Cell Sci. 107, 785-798. 18. Bousbaa, H., Correira, L., Gorbsky, G. J., and Sunkel, C. E. (1997) Mitotic phosphoepitopes are expressed in Kc cells, neuroblasts and isolated chromosomes of Drosophila melanogaster. J. Cell Sci. 110, 1979-1988. 19. Barbosa, V., Yamamoto, R. R., Henderson, D. S., and Glover, D. M. (2000) Mutation of a Drosophila gamma tubulin ring complex subunit encoded by discs degenerate-4 differentially disrupts centrosomal protein localization. Genes Dev. 14,3126-3139. 20. Cullen, C. F., Deak, P., Glover, D. M., and Ohkura, H. (1999) mini spindles: a gene encoding a conserved microtubule-associated protein required for the integrity of the mitotic spindle in Drosophila. J. Cell Biol. 146, 1005-1018. 21. Daum, J. R., Tugendreich, S., Topper, L. M., et al. (2000) The 3F3/2 antiphospho-epitope antibody binds the mitotically phosphorylated anaphase-promoting com-plex/cyclosome. Curr. Biol. 10, R850-R852. 22. Rasch, E. M. (1970) DNA cytophotometry of salivary gland nuclei and other tissue systems in dipteran larvae, in Introduction to Quantitative Cytochemistry (Weid, G. W. and Bahr, G. F., eds. ), Academic, New York, Vol. 2, pp. 357-397. 23. Prokop, A. and Technau, G. M. (1994) BrdU incorporation reveals DNA replication in non dividing glial cells in the larval abdominal CNS of Drosophila. Roux's Arch. Dev. Biol. 204, 54-61.